A new year! The older I get the faster time flys. Here it is 2013 and it has been four months since I started this blog and this is only my second entry. How is it that one can be so busy in retirement? I never was much for doing a diary but I thot I’d give this a try as I wanted to update my web site and it seem that blogs, texting and social media are the only way people communicate any more. I’m just having a hard time getting around to learning Word Press and making entries here. Not that it is that difficult to learn it just takes time and motivation. I really have lots of time I guess I’m short on motivation. So, my new year’s resolution is to spend more time on this project. We’ll see how it goes. What’s keeping me so busy? I’m not sure. Some of it is old age. I sleep, nap and watch more TV than I ever have before. But I also stay busy puttering around the house and doing various projects for the church, friends and family. I also spend a good deal of time on my wood turning hobby. Over the Christmas holiday I painted Chelsea’s room, made some frames for hanging pictures and necklaces out of old windows for her and hung them and a bunch of pictures for her. The hard part is that the walls in this 1872 house are solid brick so every hook or screw in the wall requires a hammer drill and special screws. Noisy and messy procedure. Drywall has it’s advantages. 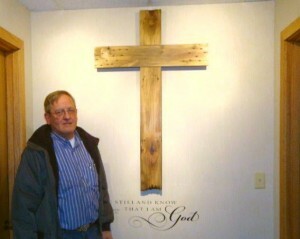 My current project is a cross for the church Prayer Room entrance foyer as well as a sign for the door. 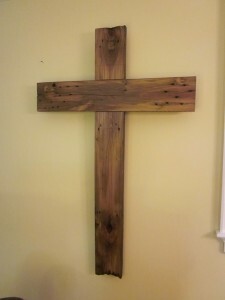 I made the cross from some old board that use to be part of a fence around our garden. Old weathered and full of nail holes. I just planed the surface a bit to remove the fungus and mold and added a coat of sealer. I need to get this installed before the end of the week. Hopefully today. The sign fits in the slit window in the door and can be flipped to indicate usage. Pictures below. What else is happening? Our wood turning group, Ohio Valley Wood turners Guild OVWG.org is having their annual Luncheon and contest on January 19th. I still don’t have a contest entry. I’ve got a couple of ideas but nothing that I think has a chance of getting a ribbon. Besides that my garage/shop is colder than a well diggers bottom and not real conducive to enjoyable creativity. So I’m not sure I’m even gonna have an entry. The next week Hannah and I are off to Franklin TN to the Tennessee Valley Woodturners Symposium the weekend of Jan 26. I’m taking Hannah to the symposium for her 70th birthday present. 🙂 Well her brother and sister-in-law from AL are going to meet us there for the weekend. They will bum around seeing the sites, Grande Ole Opry, etc., while I’m getting my fill of new wood turning ideas. We will all do the banquet an auction on Sunday evening. We may return to AL for a day or two with them after the Symposium. Should be fun. I think it is a great B-day present. I hope she is as nice to me on my birthday. What else is in store for 2013? As much as possible I spend Thursday mornings at a friends barn with 15-20 other old fogies playing at wood turning and swapping lies. Sundays are church and rest, Wednesday evening is choir practice. The second Saturday of every month is open studio night at Loveland Studios on Main where I have a booth and sell my creations. Every third Saturday is our OVWG meeting. No big events in Feb, March and April. Need to work on that. Mid may we will be at the Applachian Fest at Coney Island where our club demonstrates wood turning and sell our wares for three long days. In June we will spend a week at Branson MO with Texas Friends and later in the month we will probably go to the AAW Symposium in Tampa FL. There is a possible trip to AZ in July for a reunion of Hannah’s relatives. Gee whiz, nothing in August. Need to work on that too. September I will doing the Loveland Art Show in Nisbit Park. October will be Woodworking in America Symposium and the OVWG Symposium. Wow then it is Thanksgiving and Christmas time again. Somewhere between all this I’ll try to make stuff and work on the “honey dos” that Hannah and JoEllen find for me. Never a dull moment. Well I wasted the whole morning on this. It’s time for lunch. I wonder how many people will even read it. Till next time. A few years ago I bought a cheap web site development package called “Web Easy”. I managed to cobble together a web site, currently visible at www.kratzerkraft.com. I found the package to be very restrictive and difficult to do what I wanted to do. As a result I did not change or update the site since it’s original version. Since then I have been reading/hearing that Word Press is the easiest way to create/maintain a web site. So, today I decided to try to get Word Press working and redo my web site. It is now 12 hours later and I am making my first post to my new site. Yes it is easy if you know what you are doing and understand all the terms etc. But after several email exchanges with the 1and1 Host techies and careful re-reading of many helpful online instructions, here I am! Part of the Blogosphere. I doubt that I’ll do much Blogging but I would like to develop the site as a showcase and online store for my wood turnings. Time will tell.